We provide expert podiatry treatment using a blend of traditional techniques and high specification modern equipment . Our Chiropody / Podiatry treatments are 30 minute appointments and are carried out in a friendly and welcoming environment. 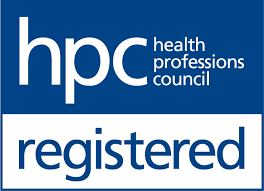 All our Podiatrist are HCPC registered and adhere to strict guidelines on infection control, decontamination procedures, patient confidentiality and patient well being. Our Podiatrist are also members of the Society of Chiropodist and Podiatrists. Our Podiatrists will provide you with up to date and correct foot health advice tailored to your individual needs, which in some cases can help to remedy many prominent foot complications such as athlete’s foot, ingrowing toe nails and fungal nail infections. If you require treatment for foot, knee or back pain this will be assessed during a Biomechanical Assessment. What happens during a Podiatry treatment? Our routine podiatry appointments are 30 minutes long. During your first appointment a full medical record including any medication is needed. A foot health assessment is performed which when used in combination with your concerns allows the Podiatrist to tailor the treatment to your needs. Any foot complaints that you have can be addressed and further advice provided if needed. We use modern, high specification medical equipment to provide you with the best possible experience. We believe our treatments are effective and we use high tech equipment along with precise podiatry skills to leave your feet feeling great. A Podiatry Treatment ? We put our feet through a lot. Have you ever stopped and thought about how much you need your feet. It’s very easy to take our feet for granted. Our feet provide a stable base for movement and are responsible for shock absorption and efficient propulsion when we walk or run. It is estimated that on average a person will take enough steps to walk the equivalent of 5 times around the Earth in their lifetime. We believe that maintaining good foot health is vital to allow our feet to perform the thankless tasks we expect of them. Are your feet giving you pain ? It’s hard to concentrate on anything when your feet hurt and they are susceptible to injury. Our feet support our body and are responsible for transferring the large amounts of force we place on them into movement and stability. It is therefore unsurprising that injuries to the feet are relatively common with painful hard skin, corns, and callus and nail damage frequently occurring. A podiatrist is able to effectively treat such conditions and in most cases provides significant relief from pain and soreness. Why not try a treatment from our Chiropodist Durham.